Dominick Cruz isn’t the only UFC star you haven’t seen in a long time. 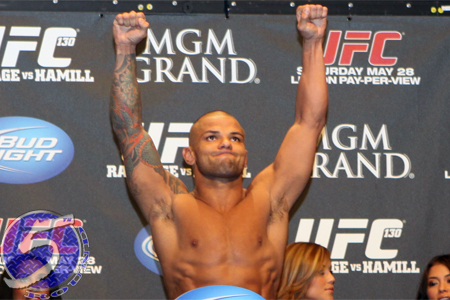 Get ready, because former UFC welterweight top contender Thaigo Alves (pictured) is finally returning to action. On Thursday, UFC officials announced Alves will battle Seth Baczynski at UFC on FOX 11. The April 19 event takes place inside Amway Center in Orlando, Florida. FOX will broadcast the main card live. Alves hasn’t been seen since getting submitted by Martin Kampmann in March 2012. It was a tango Alves had well in hand prior to the third round tapout. Since that shootout, “Pitbull” has been sidelined with a barrage of injuries. The 30-year-old has dropped four of his past six scraps. Baczynski ended his two-fight skid in November by posting a unanimous decision win over Neil Magny. “The Polish Pistola” had rattled off six straight before embarking on his losing streak. The 170-pound affair will likely appear in the night’s prelims.